It is no secret on my blog how much of a foundation junkie I am. I own thirty foundations and I decided to compare all of my high end bases. 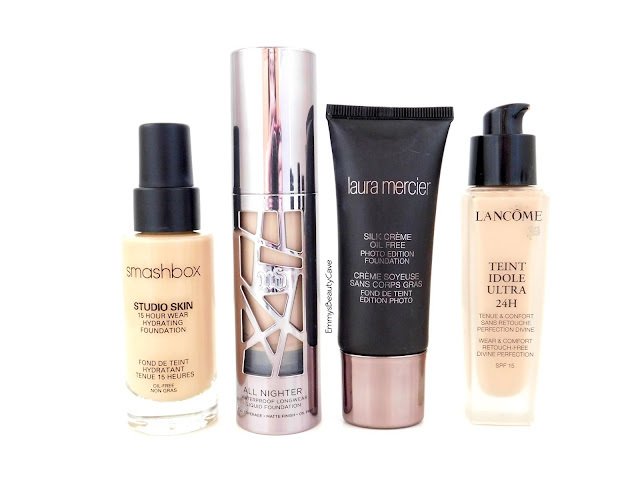 I am always on the hunt for that perfect base and I love each of these high foundations for different reasons. 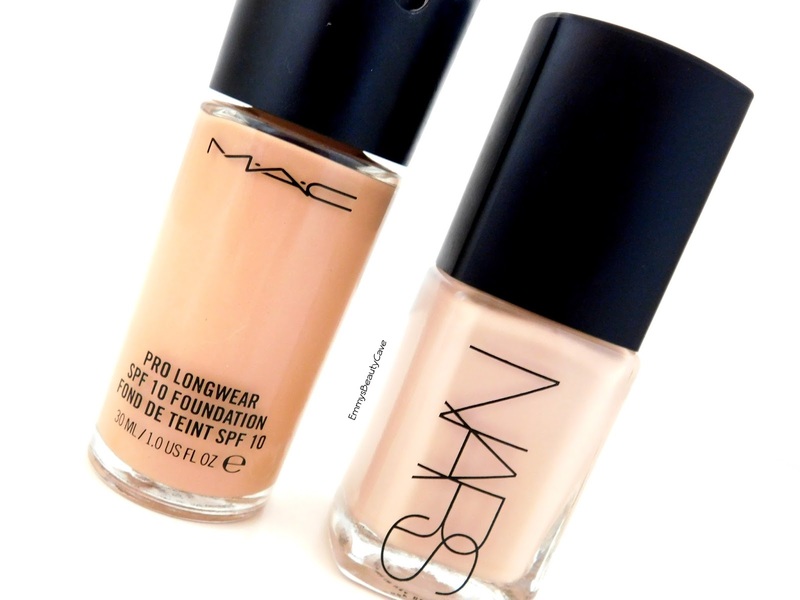 My favourite makeup products are definitely foundations and concealers, I just want that perfect base. My skin type is mainly oily especially on my nose and chin. I sometimes get small dry patches on my cheeks but otherwise my cheeks and forehead are normal, neither oily or dry. Some of these bases will work for both oily and dry skin but some will only work with oily skin. I have mentioned in each mini review what skin types they will work for. I adore this base, I go as far as saying it is my holy grail foundation. It is full coverage and makes my skin look flawless. This keeps me matte for over 10 hours without having to touch up with powder. Usually I have to touch up with powder at least once but with this I don't need to. It is a matte finish but it doesn't dry your skin out at all. It comes in 22 shades from pale skin tones to darker skin tones. If you want something that dries extremely matte this is for you. It creates the most incredible flawless base. I do find I can still get a little oily around my nose depending which powder I use. I find it works best with the RCMA Powder. Some people say it can oxidise, for me I found when swatched on my arm it oxidised but on my face it barely oxidised. This is my going out foundation. Whether I go for a meal or evenings out this is the base I choose. It is full coverage but feels very lightweight. It has a runnier consistency compared to the Smashbox and Urban Decay ones. It isn't often I get a perfect shade match but this one I do! They do a mixture of pink and yellow toned shades. I find it is a semi matte finish. 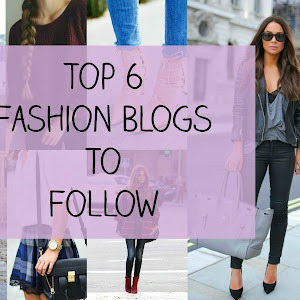 It wear well and stays looking flawless. I picked this up after hearing UmmBabyBeauty rave about it so much. I am so glad I did. If you have oily skin I 100% recommend this foundation. 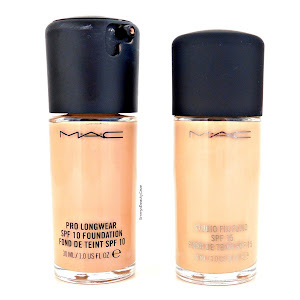 It is full coverage, blends well and lasts all day and stops me getting oily throughout the day. All of the above foundations will work for oily skin or normal skin apart from the Urban Decay Foundation which is extremely matte and doesn't work well on dry skin. 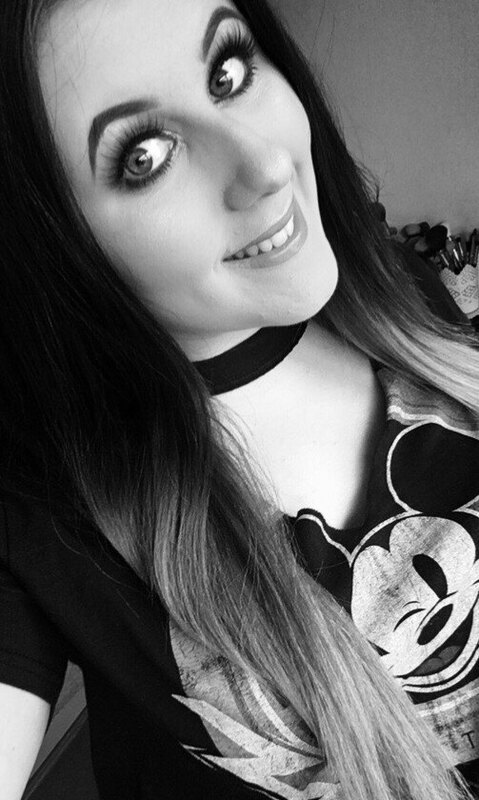 I got sent this foundation last year and have been using it for around 6 months and I still love it. I find it is medium coverage as I can still see my freckles through it. It gives a subtle radiant glow to my skin but it doesn't look too dewy. As I have oily skin I do set it with a matte powder. I have to touch up once with powder around my nose and then it stays flawless all day. I have seen people with oily skin and dry skin rave about this foundation. I got this for Christmas and I have used it alot over the past few months. It says it is medium to full coverage but it is medium I find as I can still see my freckles through it even when built up. 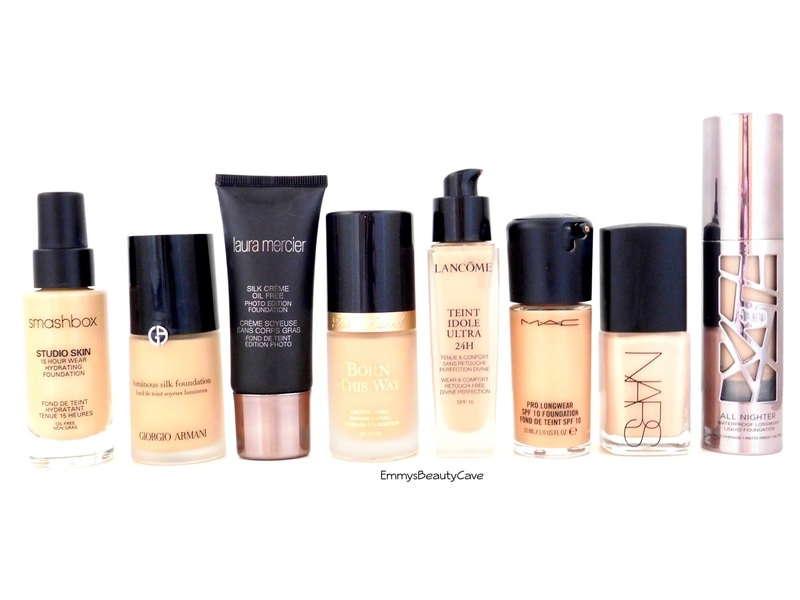 It doesn't build up to full coverage like the Urban Decay All Nighter or Smashbox foundations. It is lightweight and it does look natural. The finish is very similar to the Giorgio Armani Foundation. These two are so similar you definitely don't need to own both. I have used this foundation for so long! I also own the waterproof version which I forgot to include in this post. This is light to medium coverage. I build it up to medium coverage and it looks like your skin but better. I tend to wear this in summer along with a mattifying primer. 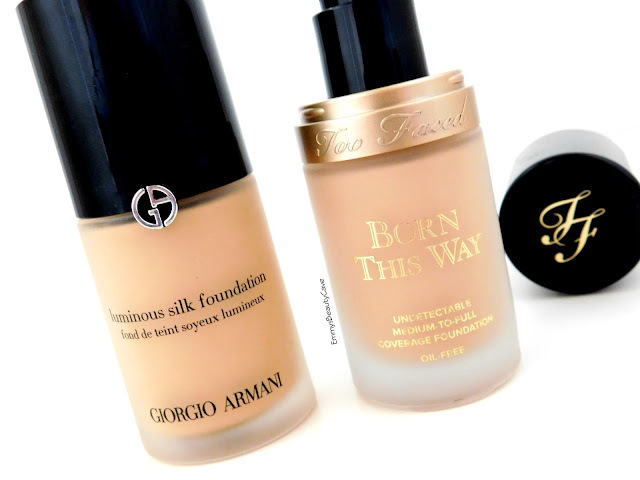 I recently did a post comparing this Pro Longwear Foundation vs Waterproof Pro Longwear Foundation. This is probably one of the most raved about foundations. I always used to think I wouldn't like it as it had glow in the name but I was wrong. It is more of a semi matte finish and it doesn't look dewy on the skin. It is medium coverage and again is your skin but better. I was so surprised how well this lasted on my oily skin. It kept me matte all day. Well over eight hours.